The next generation anti-spyware tool protecting your computer from current and future threats. 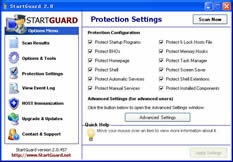 StartGuard is a 5-Star award-winning spyware blocker that not only scans and cleans your PC, it prevents spyware, adware, dialers, Trojan horses, worms, tracking cookies, browser hijackers, and other malware from downloading in the first place. While most anti-spyware tools miss quite a lot of spyware due to incomplete or outdated definition databases, StartGuard takes spyware detection to the next level by protecting all possible entry points spyware exploits to run or install without your permission. This unique "point of entry" scanning method allows for nearly 100% spyware detection and prevention, think of it as a "program firewall" that prevents programs and other startup items that try to run without your permission. No more missed spyware, constant definition updates, or need for manual scanning, StartGuard will automatically conduct a full system scan seconds before your Windows session loads and keep your system protected as you work with Real-Time protection. 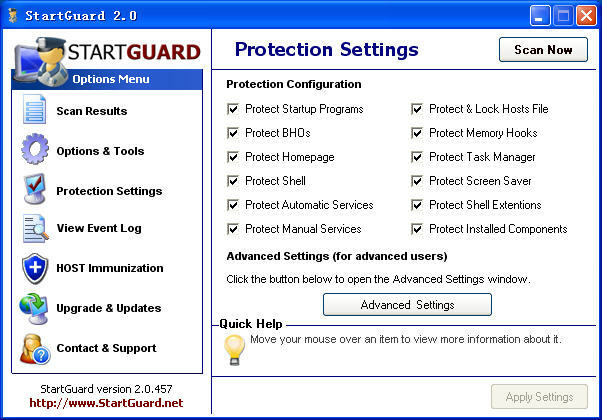 StartGuard contains many features such as Browser Immunization, System Checkpoint, and Event Logging. Block and prevent all kinds of spyware, adware, dialers, Trojan horses, key loggers, worms, tracking cookies, browser hijackers, and other malware from running. Startup Protection ensures a spyware-free system each time you turn on or restart your computer. Real-time Protection quietly monitors your system in the background, alerting you of new threats immediately upon detection. Immunize Internet Explorer, Firefox, Netscape, and any other web browser from over 10,000 sources of spyware, adware, advertisements, tracking cookies, popups, and other threats and annoyances from ever reaching your computer. Block 90% of Internet Ads using the HOST Immunization feature, allowing for faster web surfing.